A 5-h-old baby was noted to be blue and breathless on the postnatal ward and his saturations were not improving with oxygen. The antenatal and natal period had been uneventful. His birth weight was 3.09 kg. A local echocardiogram suggested supracardiac total anomalous pulmonary venous drainage (TAPVC). The baby was transferred to our center for further management. At our center, he was noted to be tachycardic, tachypneic with the significant recession. The saturations were between 75% and 80%. There were normal heart sounds and no murmurs. Chest X-ray revealed normal cardiac silhouette with pulmonary venous congestion. Echocardiography showed a prominent right-sided superior vein cava (SVC). 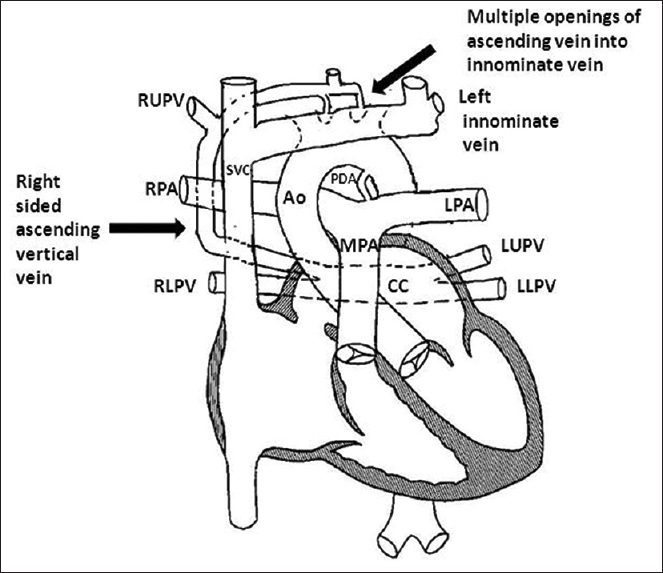 The pulmonary veins (left upper, lower, and right lower) were draining into the common chamber, and the vertical vein was ascending on the right side coursing behind the right pulmonary artery (RPA) causing a “Hemodynamic Vice” [Figure 1]. The vertical vein appeared to be draining into high SVC. To delineate the anatomy better, a computed tomography (CT) scan was performed. This showed the vertical vein ascending on the right side, going behind the RPA, and the right upper pulmonary vein was joining the ascending vein. The vertical vein then coursed behind the SVC and eventually drained into the brachiocephalic vein [Figure 2], [Figure 3] and [Video 1]. The patient was taken up for emergency surgery. 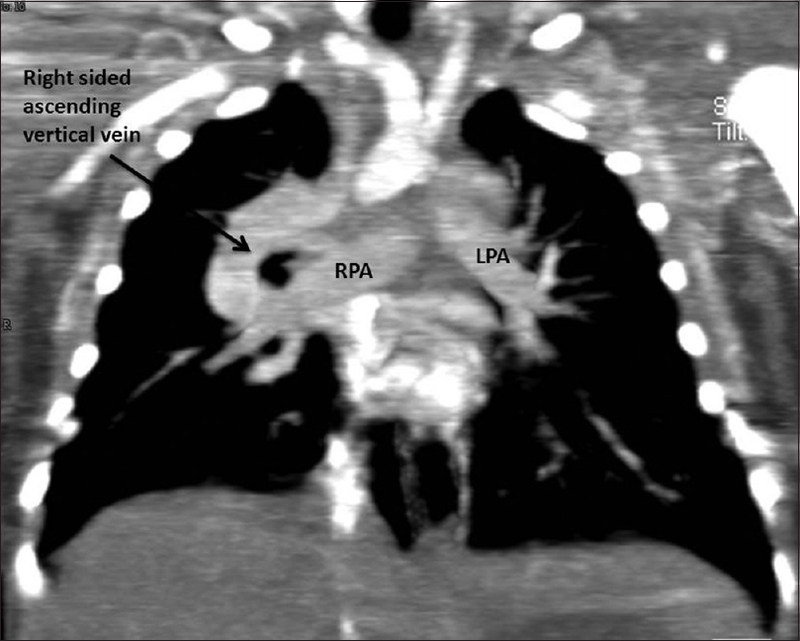 The surgical findings were similar to what had been noted on the CT scan, but the right ascending vertical vein was draining by multiple (two) drainage points into the brachiocephalic vein [Figure 4]. The defect was repaired, and the two points of drainage into the brachiocephalic vein were ligated. The baby had an uneventful postoperative recovery and was discharged home on day 14 postsurgery. Predischarge echocardiogram was satisfactory and on follow-up, the child is clinically well and asymptomatic. TAPVC is due to failure of development or atresia of the common pulmonary vein which normally joins the lung buds to the left atrium. This leads to persistence and enlargement of the embryonic channels between the lungs and the systemic veins. The most common type is the supracardiac type with drainage to the left brachiocephalic vein (45%). 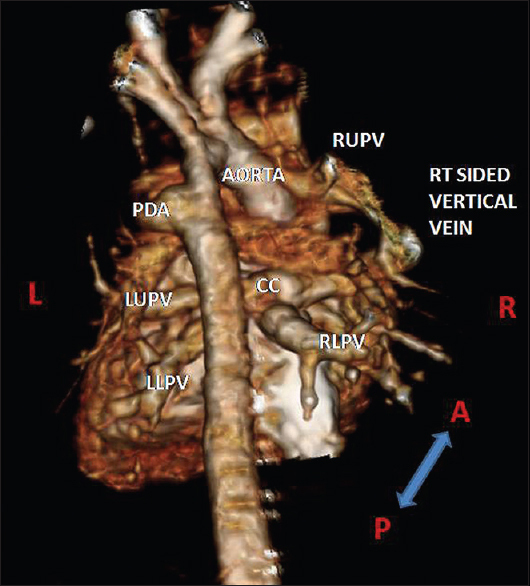 Obstruction in supracardiac TAPVC can be seen in up to 50% of cases. In most cases, there is a left-sided vertical vein which ascends through the left paravertebral gutter to join the left brachiocephalic vein. This connection with the brachiocephalic vein which then drains into the SVC produces the so-called “snowman” appearance on the chest X-ray. The left-sided “hemodynamic vice” occurs when the vertical vein passes between the left pulmonary artery and the left bronchus. The embryological left common cardinal vein connection represents the left ascending vertical vein. If the connection to the right common cardinal system becomes dominant – the right ascending vertical vein, all the pulmonary veins will drain into the SVC or SVC-right atrium junction, or the azygous vein. In this setting, the venous confluence passes inferiorly before the vertical vein rises through the right paravertebral gutter and then joins the SVC. This has been described as an “underhand snowman” on the chest X-ray. 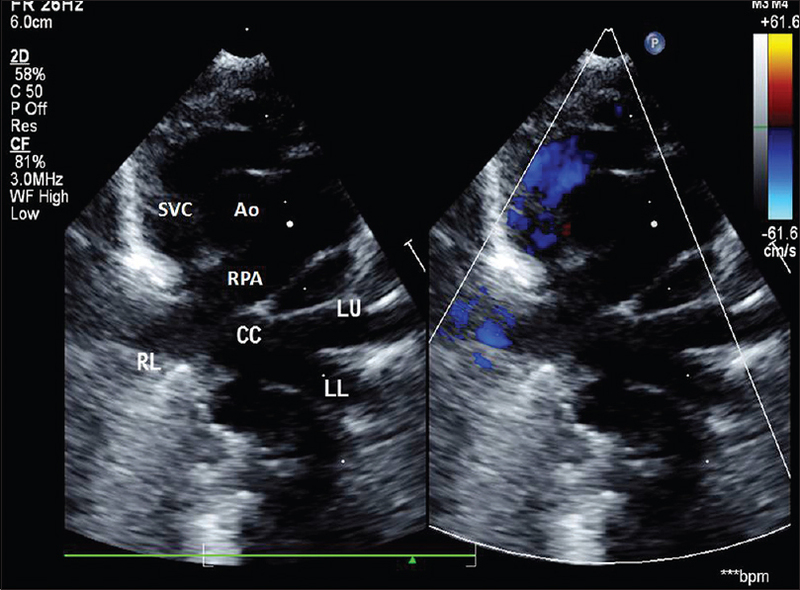 TAPVC with the right ascending vertical vein is a rare association without any other abnormalities. There can be a right-sided “hemodynamic vice” which occurs when the vertical vein passes between the RPA and the carina. This was exhibited in our patient. There was no underhand “snowman” appearance on the chest X-ray in our patient. This case highlights the use of multi-imaging modalities to accurately define the complexity of the anatomy which helps guide the surgeon's preparation for the surgery. Understanding the embryology of the human venous system enables the anatomic understanding of the unusual presentation of this case with the right-sided “Hemodynamic vice”. Brown DW, Geva T. Anomalies of the pulmonary veins. In: Allen H, Driscoll D, Shaddy R, Feltes T, editors. Moss and Adams' Heart Disease in Infants, Children, and Adolescents. 8th ed. Philadelphia, PA: Lippincott Williams and Wilkins; 2013. p. 823-5. Hlavacek AM, Shirali GS, Anderson RH. Pulmonary venous abnormalities. In: Anderson RH, Baker EJ, Redington A, Rigby ML, Penny D, Wernovsky G, editors. Paediatric Cardiology. London: Churchill Livingstone; 2009. p. 497-522. Douglas YL, Jongbloed MR, Deruiter MC, Gittenberger-de Groot AC. Normal and abnormal development of pulmonary veins: State of the art and correlation with clinical entities. Int J Cardiol 2011;147:13-24.